Hands On Bike: Unveiling my Mobile Bike Tools Cabinet! 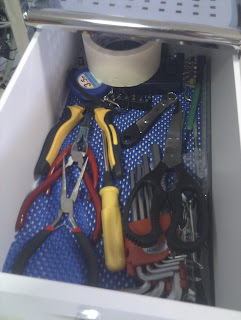 Unveiling my Mobile Bike Tools Cabinet! Finally found time to organise and tidy up all my bike stuff! 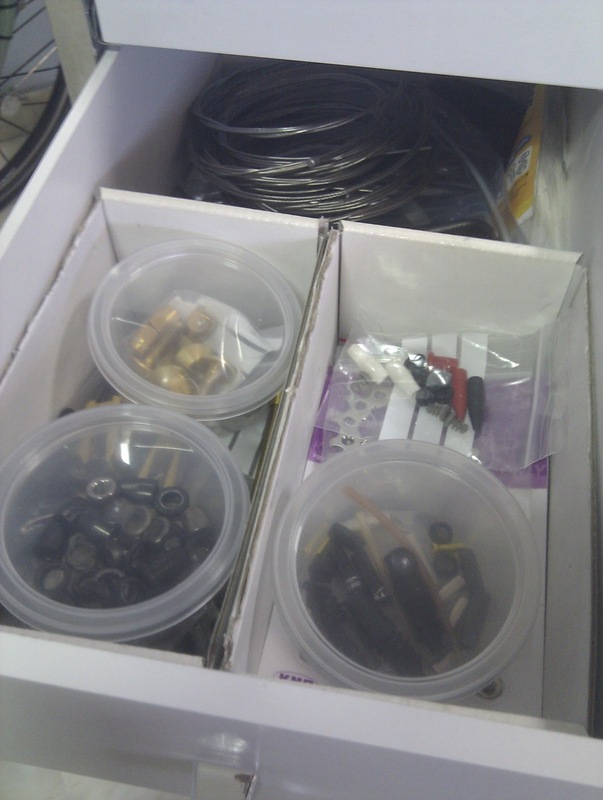 I had a lot of tools and spare parts lying all over the place, in boxes, on the ground, practically everywhere. Also, everything was messed up, with lights being stored with velcro, rags being stored with allen keys and stuff like that. 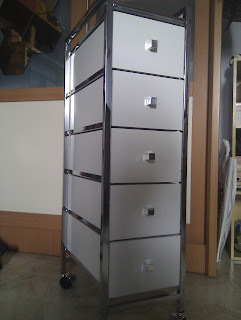 Got a nice little cabinet on wheels from Howard's Storage World! 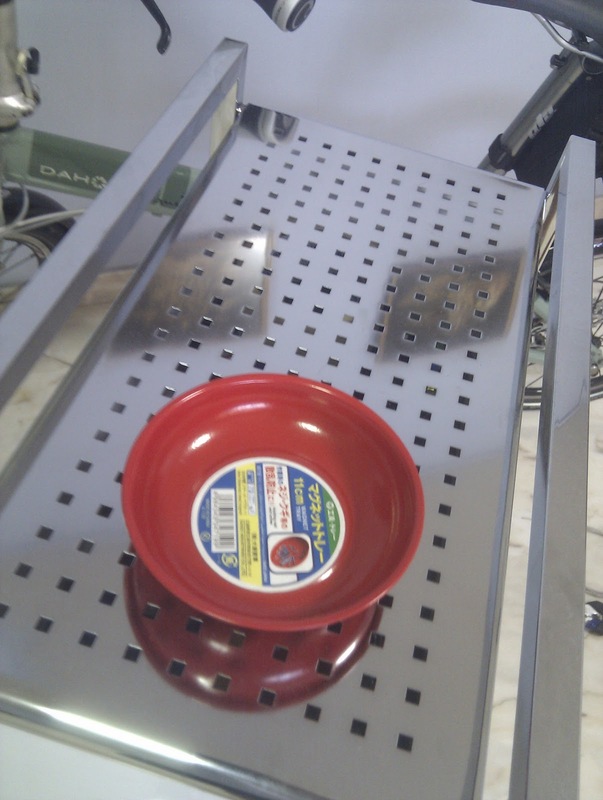 With a top shelf, it is useful when I want to place spare parts or other components on the cabinet. Little red magnetic dish from Daiso holds bolts and other small parts without losing them! Top drawer stores generic tools,such as screwdriver, Allen wrenches, pliers, scissors etc. spare bolts and nuts, brake pads etc. 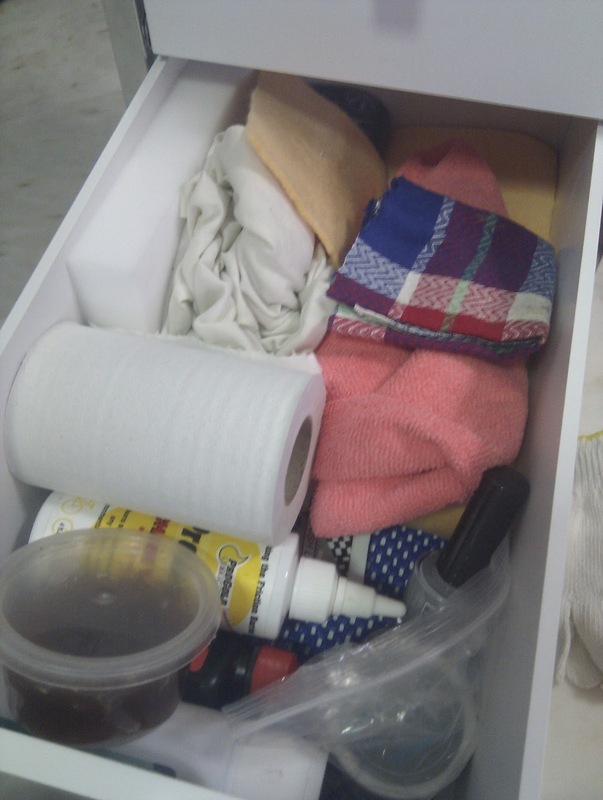 Fourth drawer stores the stuff used to clean and lube the bike, such as rags, wax polish, grease, chain lube etc. Didn't manage to fit my bottle of degreaser. 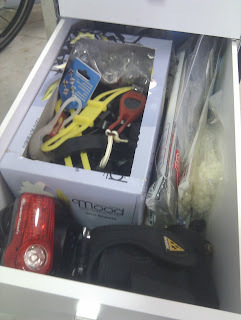 And the bottom drawer stores the heavy stuff, including many bike specific tools. 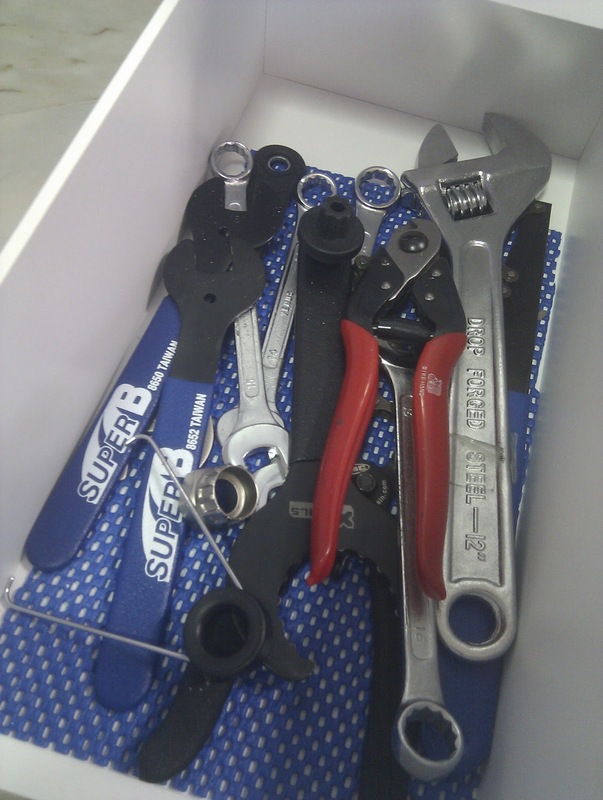 Includes cone wrenches, Hollowtech II BB tool, cable cutter, chain whip, cassette lockring tool etc. With all the tools and small parts in one place, bike maintenance is made easy! No more moving around the house gathering the tools or parts, or carrying them around. Just pull the whole cabinet with you, everything you need will be there! Extremely pleased with my mobile bike tools cabinet, recommended for all DIY bike mechanics out there! 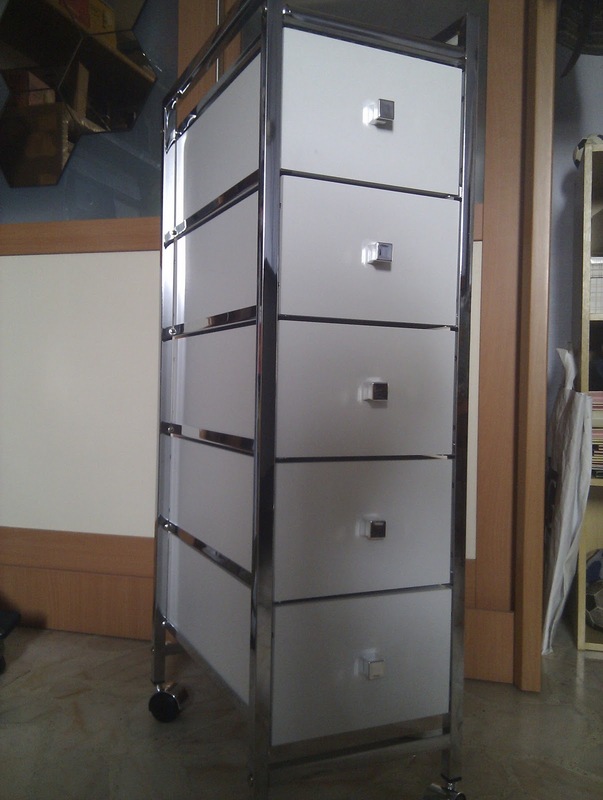 yes do check out the cabinets on wheels there. got different widths and heights to choose from! High Profile 20" Carbon Wheelsets! Rolling the Dahon Boardwalk TT around with ease!